Now this beauty is pretty astonishing, I correct myself . . . she is OUTSTANDING!! Dating back to before 300BC there is not a great deal of information regarding the history of this Diadem. Before any of you get confused, a Diadem is a type of crown worn as a sign of royalty with the word itself originating from Greek: diadein meaning to bind around; this is quite an archaic term and not used much nowadays having been replaced with Crown and Tiara. 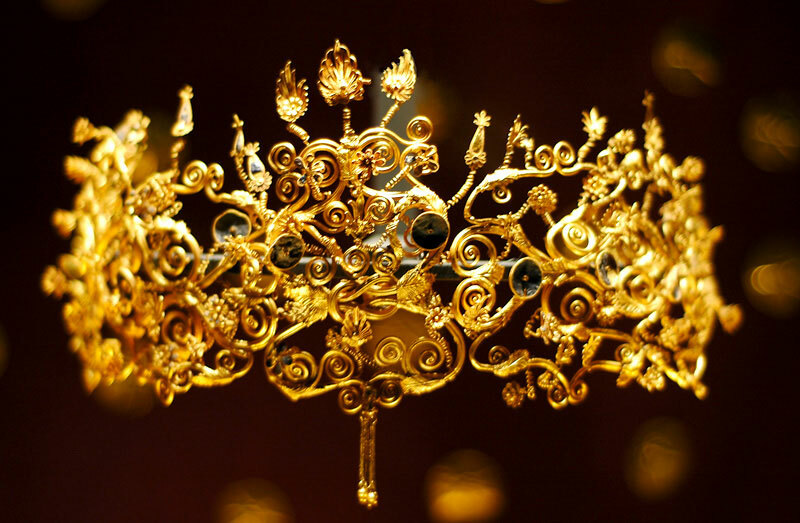 Discovered in one of the 3 great tombs of the Royal Tumulus during the late 1970s this Diadem had kept its beauty hidden from us for over 2,000 years! Believed to belong to one of Philip II Macedon's 7 wives this golden Diadem has an unbelieveable history that we will never truly know. The mystery doesn't just end at who this belonged to but also within its exquisite detail; all the twists and twirls conceling intricate craftsmanship including a tiny Bee nestled on the top leaf. If this is how beautiful and pristine this piece looks now just imagine how glorious it would have looked in its original condition 2,000 years ago! 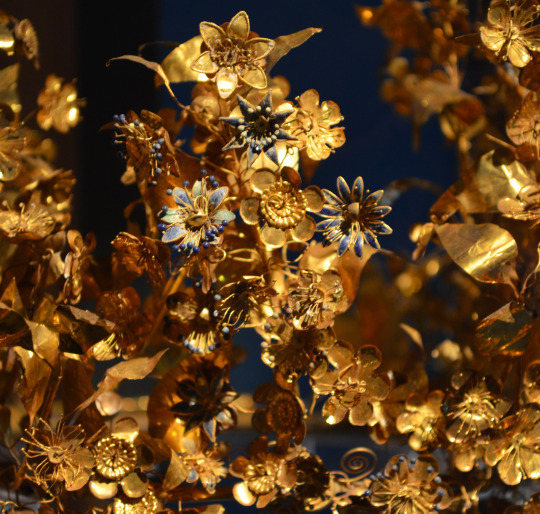 Discovered during the same excavation, the Gold Myrtle Wreath is thought to belong to Meda, the Thracian Princess and 5th wife - or 6th as there are still debates regarding the wife timeline considering he had more than 1 wive on the go occassionally - to Philip II Macedon. The theory behind the owner of this piece was theorized by Greek archaeologist Manolis Andronikos but unfortunately, like the previous Diadem, we will never actually know whos head this nestled ontop of. Myrtle is seen as a symbol of Love and therefore a sacred plant to the Goddess Aphrodite, the blossoms and leaves of Myrtle have been intricately created from Gold sheet showing beautiful Hellenistic craftsmanship. The Myrtle Wreath we see today is the restored creation with 30 leaves and 112 flowers all together. The worlds oldest flower crown! C'est magnifique, no?! I certainly think so. A more modern piece after the previous 2 tiaras - give or take a few thousand years - but by no means does that make it less grand or opulent and my goodness has this Tiara seen some significant historical moments. In its original state the Angouleme Emerald Tiara balanced over 1,000 diamonds set into silver and 40 Emeralds set into gold - 14 of these were the largest Emeralds from the royal collection and the Emeralds totalled 79.12 carats. The original owner of this masterpiece was the only surviving child of the tragic Louis XVI and Marie Antoinette, Marie-Therese after it was comissioned for her by Louis-Antoine Duc d'Angouleme her husband . . . and 1st Cousin - well you know these royals like to keep it in the family! Despite being the first person to wear the Tiara Marie-Therese never actually owned it outright due to the fact that all the stones and precious metals belonged to the state therefore when Marie-Therese was exiled and left for England in 1830 she had to leave her beloved Tiara behind. 18 years passed with the Tiara secured at the State Treasury before it was seen in public again this time perched on the head of Empress Eugenie, Napoleon III's empress consort. The empress frequently wore the Angouleme Emerald Tiara as it undoubtedly complimented her pale complexion and Red hair, however she was to face the same fate as the Duchesse d'Angloueme and the Tiara was returned yet again to the state before she was sent off in exile to England. Since then this glorious piece has sadly never graced the head of another royal and was instead kept in various vaults across France between 1870 and may 1887 when all of the crown jewels were put up for auction as they were seen as an ugly reminder of the past; the Emerald Tiara was sold to an unknown English jeweller. This is where we are all checking our family tree to see if said jeweller was in the family and perhaps this breathtaking beauty is hidden in the attic under the box of 80's records but unfortunately not; the Tiara eventually ended up in the Wartski Jewellery firm. The Tiara stayed in London where between 1982 - 2002 it was displayed in the Victoria and Albert Museum. A temporary export ban was placed on the Tiara in 2002 when the owner decided to sell but without a national buyer or the V & A being able to find a wealthy benefactor for a permenant disply the export ban expired and the owner was welcomed with a large offer from Louvre Museum meaning the Angouleme Emerald Tiara could return home. Having survived the French revolution, restoration and both installations of the empire she definitely deserves a well earned rest where we can all gaze upon her glory. Erm, WOW! Firstly for those who do not know a 'Parure' is the full set of jewellery; the Tiara, earrings, necklace, brooch and bracelets. To wear a full Parure is no mean feat at all and to pull it off well takes an exceptional amount of elegance and style - it is unfortunately very rare to see these days. The Bavarian Ruby and Spinel Parure was made in 1830 for Queen Therese of Bavaria (born Princess of Saxe-Hildburghausen) the Rubies representing Therese's birth stone with her birthday being July 8th. The Parure was passed down the generations but the Tiara was rarely worn due to sheer size and weight of it apparently making it incredily uncomfortable - I'd be more than willing to try it out if anybody would like to know for definite. Today the Parure belongs to the 'Munich Residenz' (former Palace of the Bavarian Royal family) where it is often displayed for the public to view. Such a shame that there isn't more of a story to this incredible beauty, I guess that goes to show that bigger doesn't always mean better as what a waste for this 'tour de force' to just sit in a box for the majority of its life. Did you honestly think I would let the Russians would slip through my fingers?! And Pearls as well for that matter! This astonishing Tiara speaks for itself making a decadent statement to the world about its wearer. Created in the early 19th Century, by court jeweller Bolin, the extravagant structure is made from Brazilian diamonds and Ancient Pearls giving it its other name of 'Diadem of Ancient Pearls'; making a near-circle at the back it is verging on technically being a Crown but I prefer the term Tiara, it sounds more elegant. 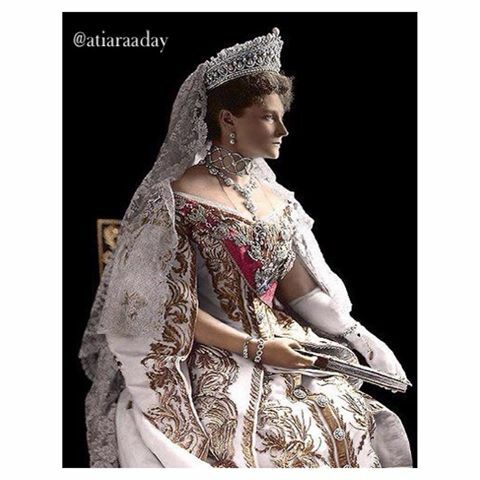 The very last owner of this spectacular Tiara was Empress Alexandra Feodorovna the last Tsarina of Russia, consort to Tsar Nicholas II and Grand-daughter of Queen Victoria. It is said that Alexandra was very fond of this Tiara which is surprising considering she was reknowned for lacking enthusiasm when it came to royal outings and formal affairs. As with the majority of crown jewels, this Tiara did not personally belong to the Tsarina and the Tiara was kept in the jewel room of the Winter palace where she would have to sign a receipt when checking out any of the Imperial jewels and give a date as to when she would be returning them. After the Romanovs demise in 1918 the Imperial jewels were seized by Bolsheviks and this piece has never been seen since - a heatbreaking end to both stories. I personally feel it was probably destroyed and sold on as you can't exactly misplace a Tiara like that now can you, but unfortunately I doubt we will ever know what happened to it. Well lovelies I had an absolute blast writing this blog and shall definitely be exploring more Tiaras and sharing them with you in the future as there are SO MANY!! In the meantime you can visit the Lemon Land Pinterest where, of course, there is a 'Tiara Town' board full of sparkly beauties! What are your favourite historical Tiaras? !